Sends the endlessly bickering couple to Paris, where the great director Roman Polanski gives them a rectal exam. I wish I were kidding. 91 min. New Line Cinema. Director: Brett Ratner. Cast: Jackie Chan, Chris Tucker, Max von Sydow, Noemie Lenoir, Hiroyuki Sanada. After an absence of six years, Chris Tucker's overcooked shtick hasn't aged well, and neither has the Rush Hour formula. 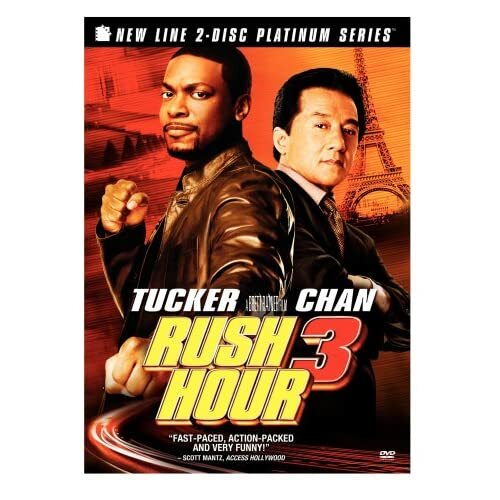 Now that Chan's noble detective Lee has been a fish out of water in L.A., and Tucker's racially insensitive detective Carter has been a fish out of water in Hong Kong, Rush Hour 3 has no new territory to cover. Screenwriter Jeff Nathanson sends the endlessly bickering couple to Paris, where the great director Roman Polanski gives them a rectal exam. I wish I were kidding. The action begins in L.A., where world's worst cop Carter directs traffic to crash as Lee plays bodyguard at the World Criminal Court. An assasination attempt brings our heroes back together and eventually off to the City of Lights to assure the security of an upcoming summit. Turns out the Chinese Triad crime syndicate is behind the nefarious murder plot. They'll go to any lengths to protect their secrets, and one of the gangsters (played by Sunshine's Hiroyuki Sanada) has a personal connection to Lee that complicates the investigation. Did I mention Max von Sydow skulks around trying not to get pegged as a bad guy? The Rush Hour films have always had an uneasy relationship to Chan's genius for comedic action. Chan brings his own stunt team and his own staggering experience in staging action and directing films, and he's admitted to frustrations with the Hollywood way of doing things (and, I suspect, director Brett Ratner, who effectively stands back and lets Chan direct his own action). And there's no denying that as the years have flown, the issue of the ratio of action to acting (a.k.a. plot) has been muddied by Chan's age and desire to branch out as an actor as his physical abilities inevitably diminish. Rush Hour 3 consequently has some fights for Chan, but they're not terribly satisfying. Ratner compensates with a fun car chase in the film's midsection, but the onus largely rests on ridiculous plot and depressing comedy to keep the picture moving. Tucker desperately flings around the word "mushu" (are these even jokes? ), Tucker and Chan sing a surreal duet ("Closer I Get to You"), and there's a lot of badly played (and worse, redundant) shtick about how the two characters can't quit each other (a love montage set to Elton John's "Sorry Seems to Be the Hardest Word"). It all winds up in a big action sequence at the Eiffel Tower, a good location for Chan's brand of slippery-monkey moves. But Chan's talent clearly is wasted on this money-grab sequel. Ratner manages some attractive location work amid large-scale action sequences—too bad he has no class, taste, or sense of humor. Though Rush Hour 3 is the weakest in a generally entertaining series, completists and die-hard Jackie Chan fans will not be disappointed by the 2-Disc Platinum Series DVD from New Line Home Entertainment, which lives up to the high standard set by the two previous releases. Disc One houses a technically proficent transfer and high-quality surround mix, as well as a feature commentary by director Brett Ratner and screenwriter Jeff Nathanson; their buddy-buddy banter is an apt complement to the film. Disc Two collects the lion's share of the extras, starting with the thorough Laurent Bouzereau documentary "Making Rush Hour 3" (1:27:57) Interview subjects include Ratner; Nathanson; actors Chan, Tucker, Polanski, Attal, Julie Depardieu, Noemie Lenoir, Youki Kudoh, Hiroyuki Sanada, Zhang Jingchu, Tzi Ma, Sun Ming Ming; producers Arthur Sarkissian, Andrew Z. Davis, Jay Stern, Jonathan Glickman, and Roger Birnbaum; production designer Edward Verreaux; costume designer Betsy Heimann; director of photography J. Michael Muro; Second Unit Director/Stunt Coordinator Conrad Palmisano; special effects supervisor Clay Pinney; visual effects supervisor John Bruno; U.S. stunt coordinator Eddie Braun; choreographer Marguerite Derricks; editors Don and Dean Zimmerman and Mark Helfrich; sound designer/sound re-recording mixer Tim Chau; and composer Lalo Schifrin. In typical Bouzereau fashion, the doc covers all aspects of production, including the often overlooked sound design and scoring. A viewer can also get a real sense of how the film was planned and shot, when and how wire-work was employed, etc. There's also a conspicuous amount of talk about Rush Hour 4— Ratner offers two deleted scenes, four extended scenes, and an alternate ending, with a "play all" feature and optional commentary by Ratner and Nathanson. All are worth watching (the first has some good one-liners for Tucker), and the self-effacing commentary gives some idea of why the scenes were eliminated. Next up is the "Le Rush Hour Trois Production Diary" (1:05:02). As on previous discs, here's an hour-long compilation of footage shot throughout the production on a consumer-grade camera. The editing is choppy, resulting in lots of non sequiturs and unexplained in-jokes, but some of the best behind-the-scenes gems can be found here, with Ratner demonstrating what he wants, Chan giving action direction, and cast and crew joking around. In addition to footage of Polanski's time on set, we get cameo appearances by Bryan Singer and Robert Evans. Lastly, there's a nifty "Visual Effects Reel" (2:02) (and, if you're clever with your remote, a five-second easter egg in the vicinity) and two and a half minutes of "Outtakes". This is a fully-loaded edition Rush Hour fans will want to bring home for the holidays. All site content © 2000-2019 Peter Canavese. Page generated at 04/24/2019 04:46:16PM.